Few pieces of jewelry as are versatile as hoop earrings, and these pieces make it easy to see why the hoop is a perpetual favorite. This highly-polished pair is crafted from 14K yellow gold with style that has proven it has staying power. These contemporary classics gradually widen toward the bottom of each hoop, creating a look that's just as fitting with jeans and a T-shirt as it is with your Sunday best. Sized to draw just the right amount of attention, these pieces are always appropriate. Hinged closures make it a snap to slip on these earrings and add a touch of timeless class. Earrings measure 21mm x 18mm and weigh approx. 1.8 grams. 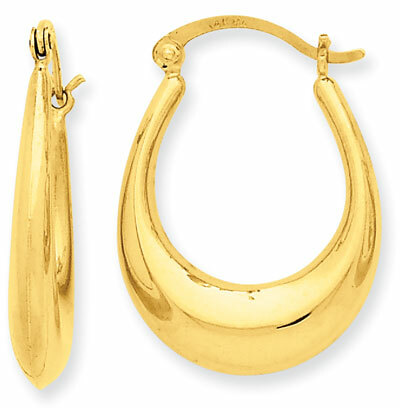 We guarantee our Graduated Oval hoop Earrings, 14K Yellow Gold to be high quality, authentic jewelry, as described above.